At the height of summer, produce from the 20 million Victory Gardens planted yielded 9-10 million tons of harvest. Everything needed to be canned and stored. 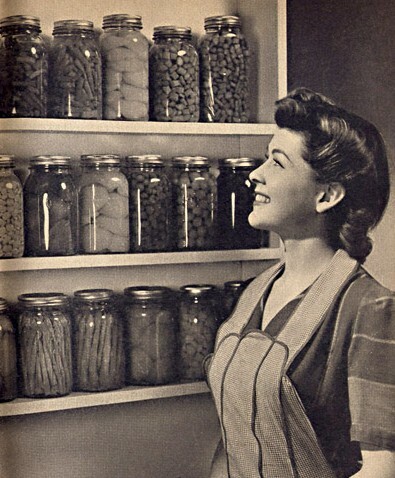 The average homemaker covering a factory position put in 12 hours, six days a week and still had hours of canning when she got home. Canning, preserving, processing, “putting up”, was becoming a lost art compared to what was done in the first World War, on farms, and through the 1930’s. 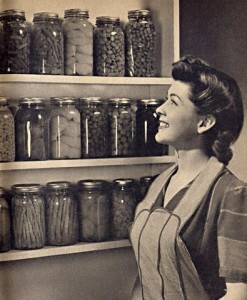 The 1940’s home maker was often referring back to instructions and methods used by her grandmother. Canning almost skipped a generation back then; it surely has skipped several generations in present day. Convenience wins out. And, I think some of us are scared off by the warnings about what happens when it’s done wrong. 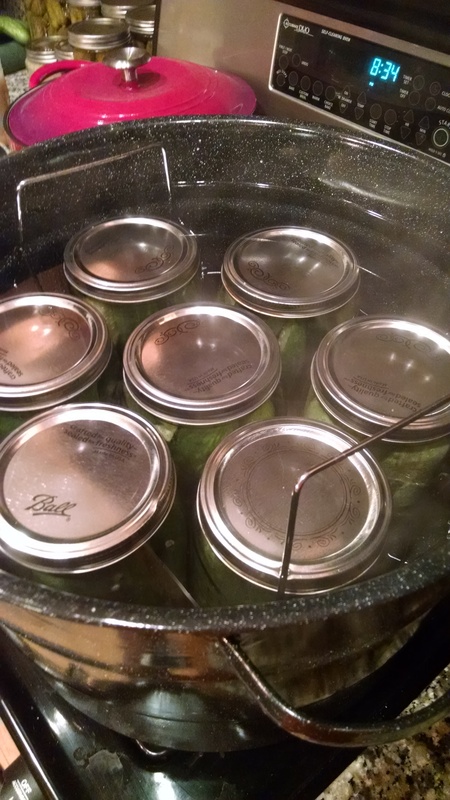 I turned to my Aunt Carol to teach me the right (safe) way of water bath canning. My mom was there too picking up the routine. The biggest lesson learned was about streamlining the process. An unorganized operation will not work. Starting out with cucumbers and dill, we went about making dill pickles. 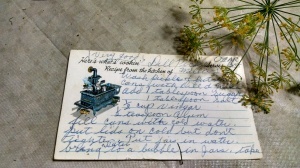 Carol’s recipe is from Oscar, her dear friend. 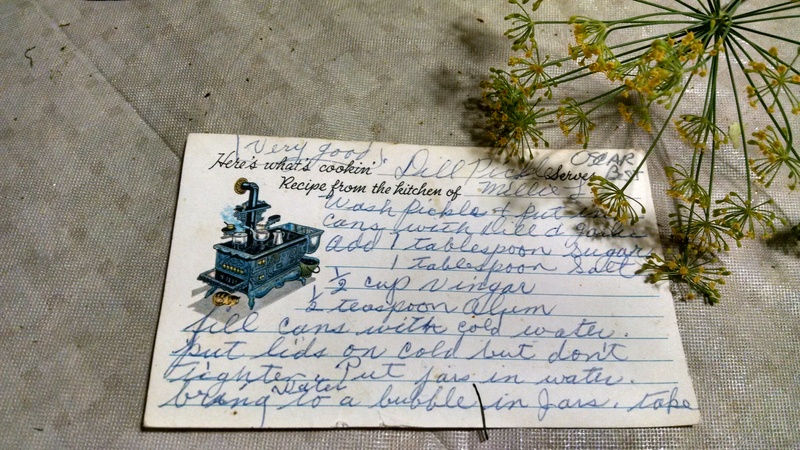 We’ve held on tight to Grandma Crook’s Liberty Pickle and Sunshine Pickle recipes, but for our favorite — it’s Oscar’s recipe. 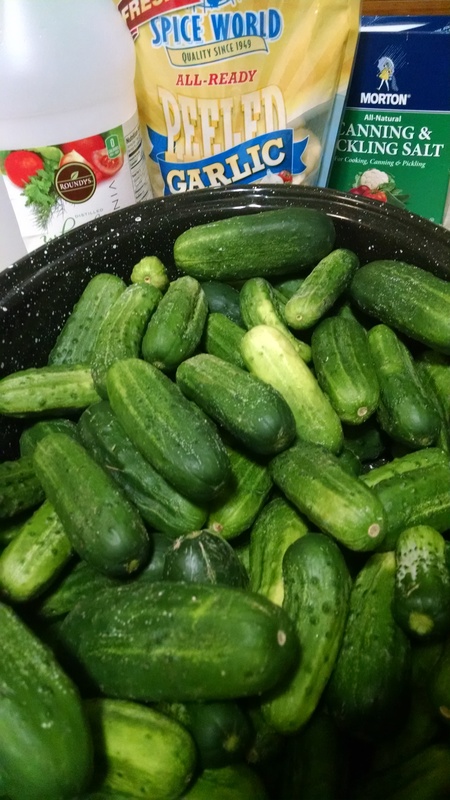 We lined up a bushel of pickling cucumbers through an Amish neighbor. One bushel weighs 48 pounds and is equal to 16-24 quarts of pickles in jars. My mom and Carol spent hours scrubbing the cucumbers clean. 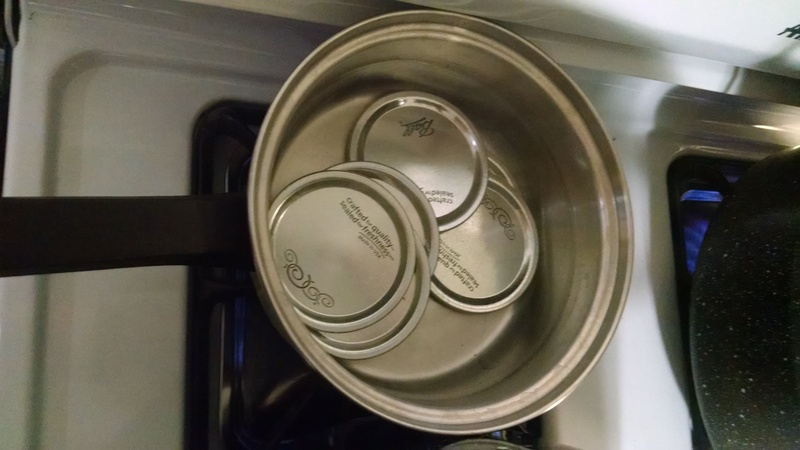 The jars were sterilized in the dishwasher, the lids and bands were placed in boiling water on the stove, and our canning kettle with water boiling, all waiting. On a table, we lined up tubs: one for sugar, one for canning salt, one for alum. We had vinegar, garlic cloves ready, onion chunks, and dill waiting. Step one: Place two sprigs of dill, one chunk of onion and two cloves of garlic in each jar. 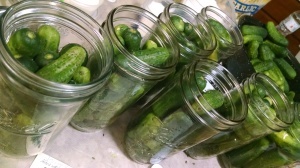 Step two: Pack the jars as full as possible with the cucumbers. Step three: Add to each jar 1 T canning salt, 1 T sugar, 1/2 tsp. alum, and 1/2 C white vinegar. Step four: Fill the remaining jar space up to 1/4″ from the rim with water. Step five: With a damp cloth, trace the rim of each jar and then place a lid on each. Put a band on each, but do not tighten the bands. 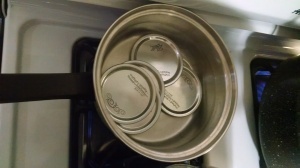 Step six: Place jars in the canning kettle, with about 1″ water over the tops of the jars. Let the jars boil in the kettle until the water in the jars start to bubble. About 20-25 minutes. Step seven: Take the jars out of the kettle and tighten the band. As the jars cool, you’ll hear that wonderful “pop” that tells you things are going well. If the jars don’t make that pop, they aren’t sealed and then you have to eat up! 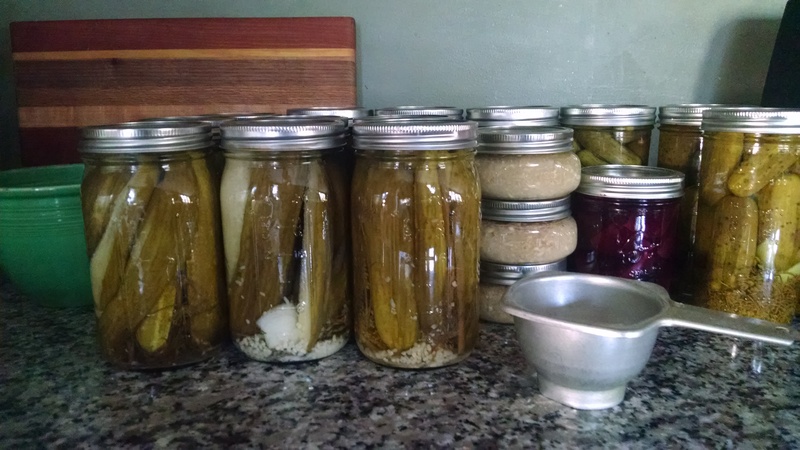 You won’t be able to store unsealed pickles for more than two weeks. Ideally, the first jar can be opened after two months of storage, but pace yourself – what you put up in August has to make it until next August! I added a couple of jars of horseradish and beets to this picture. We’ll see how that experiment ends the next time I bake a ham. Stay tuned on that! 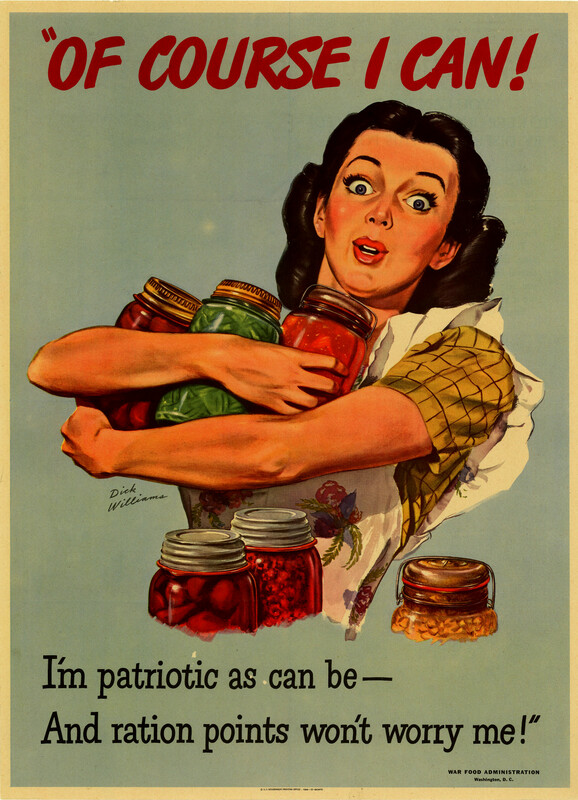 Beautiful shelves of canned fruits and vegetables were something to be proud of in WWII… and still are!